I was helping a friend debug a OutOfMemory exception in a Java web application. The program made heavy use of StringBuilder and was appending a large number of strings. An entire record set (containing thousands of records) was essentially converted into an XML string. Strangely when the OOM error occured, there was still plenty of heap memory available. Furthur deep-dive debugging and some googling around, taught a few important lessons. Whenever the internal buffer capacity of StringBuilder/StringBuffer is exceeded, then the next character array size it creates is twice of the original size. A good blog explaining this is here. Hence it is better to initialize the initial capacity of the StringBuilder to a reasonable value beforehand. Try to use a 64-bit machine, as there are no practical limitations for the heap memory allocation and also it is much easier to find a continous block of memory due to 64-bit addressing. Alter the design of the program to not store the string in memory, but in a file. Alternatively stream it directly to the HTTP response. In one of my previous posts, I had blogged about creating a taxonomy of services using functional categorization. For e.g. Entity Services, Task/Activity Services, Process Services and Infrastructure services. But services can also be categorized from different perspectives such as layers or intent of use. For e.g. 1. Business Services: Represent high level business functions that define an enterprise. 2. Application Services: Application specific and usually will be aggregated in a composite service at the business level. 3. Infrastructure Services: Utility functions that deliver cross cutting functions. 1. Enterprise Services: Multiple LOBs use the service. 2. Domain Services: Applicable only within a LOB. 3. Application Services: Local to the App Level. Found a couple of good articles reflecting on the difference between the two. Oracle Web Service Manager is an integral part of the Oracle SOA suite and it allows us to implement security declaratively; without any coding from the developer. Security policies can be enforced at run-time using WSM agents or WSM gateways. There is another product called "Oracle Enterprise Gateway" that has features that overlap with OWSM - hence this results in lot of confusion. So, lets understand the concepts one by one. A WSM agent is a component that is installed with the endpoint service. So it provides the 'last-mile' security (last security layer). Now OWSM also a gateway component where security policies can be employed in a central location. A gateway can also perform functions that an agent cannot do, such as message routing, transformations, and failover. OWSM also has an extension for OSB, that allows us to use OWSM policies at the OSB (ESB) layer. These capabilities would suffice the requirements of most intranet SOA infrastructures. 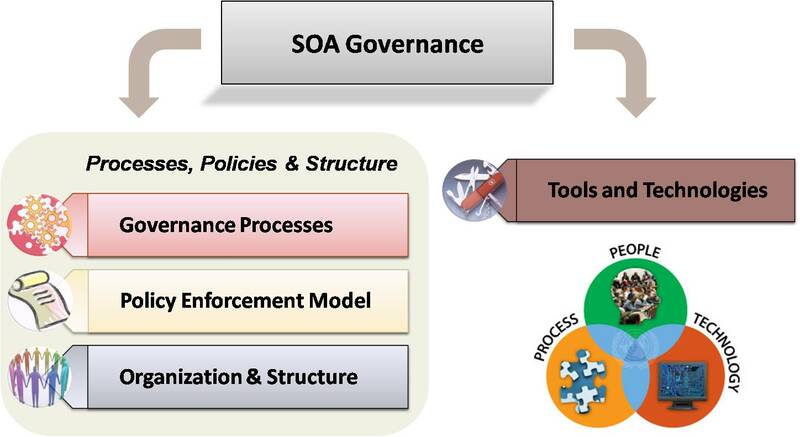 Oracle positions the Oracle Enterprise Gateway as the first line of defence ("perimiter security") when SOA services are exposed to the outside world. This is the equivalent of a DMZ firewall. So it looks like Oracle Enteprise Gateway is a more expansive product that can do everything that OWSM does, plus all the bells and whistles. Recently during one of our internal brainstorming sessions, there was a lot of confusion over the various components available on the Oracle platform to build a robust MDM solution. Part of the confusion was because Oracle has picked up best of breed components from various acquisitions and integrated them together to form the MDM suite. Its important to understand that when someone talks about Oracle MDM - it is a suite of components and NOT just one product. Oracle's acquisition of Hyperion has further added to the confusion, as Hyperion has full capabilites to be used as a MDM solution. Oracle promotes Hyperion Data Relationship Manager as a component in its MDM suite - that can be used for managing the relationships between different attributes of master data from disparate sources. At the fundamental level, to build a MDM end-to-end solution, you need basic components such as a ETL tool, Data Profiler, Data Cleansing Engine that can be used for standarization, de-duplication, validation, etc. Given below are the core components of the Oracle MDM suite, followed by optional components that help in jump-starting your MDM journey. Oracle Data Quality / Data Profiling: Oracle Data Profiling allows us to profile the master data and investigate the content and the structure of their different data sources. It also gives users the ability to monitor the evolution of data quality over time using Time Series. Oracle Data Quality allows us to standardize, validate, cleanse and enrich master data – for e.g. master list of securities, issuers, official list, etc. Using both these tools will ensure the integrity of data stored in the MDM data store. Oracle Business Intelligence Suite: OBIEE can be used for analytics and reporting on master data entities. I often wondered what heuristics the Task Parallel Library (TPL) in .NET uses to control the number of threads for optimal utilization on multi-core machines. Found a great discussion thread on StackOverFlow explaining the details. There are certain pros and cons of this approach. Clear separation of markup/layout from content. Heavy XSL processing offloaded to the brower, brower JS code can check for brower compatibilities and spit out right markup code. All browsers do not support XSL in a standard way. Can be quite a pain to make the look-n-feel compatible with all browsers. Search engines/bots see raw XML, may not be able to interpret and understand. Disables progressive rendering. User won't see anything at all until entire stylesheet and data is loaded completely. XSL is pretty tough to master. Resource skill could become a potential bottleneck. Could run into scalability issues for large XML payloads. When processing XML files, XSLT must load the entire document into memory. IMHO, although XSLT processing in-browser is fast compared to server side, it is still better if no transformation is required at all. There are tons of server side web-frameworks that can do the job better and faster. Long back, I had blogged about native APIs in .NET and Java to read/write Excel files. Recently came across a new native .NET library that can be used to read/write Excel files and supports the binary BIFF format. This is the format used by Excel 2005 files - i.e. xls files. This API is still evolving and looks quite basic at this point of time. The new office (2007, 2010) documents are based on XML standards (i.e. xlsx files). There are a couple of open source projects for creating and modifying 2007 'xlsx' excel files. While defining the enterprise architecture of an organization, it is essential to understand the various processes, functions and capabilities of the business. Recently came across the FEA Business Reference Model on Wikipedia. The simplicity of the diagram impressed me. Every organization has different business areas or LOBs. Each business area has a set of business functions that it performs. A ‘Business Function Model’ describes these functional areas and sub-functions in a graphical representation. An example of a BFM can be found here. Each LOB executes its business functions by following certain business processes. 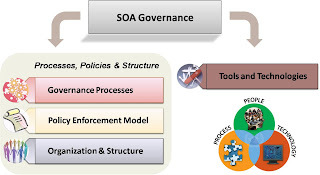 A business process is an orchestration of different business activities and tasks that may be exposed as SOA services. When we design our applications to be secure, we have to consider all aspects of security. I have often seen people associate security with just authentication and authorization, but there are other security principles to be considered as stated below. Integrity: We have to ensure that all messages/data have not been tampered with. Integrity of messages ensures that the data has not been maliciously modified by 'man-in-the-middle'. Confidentiality: This security principle ensures that all messages are encrypted and cannot be eavesdropped. Authentication/Authorization: Ensure that all resource access goes through a proper authentication process. Non-Repudiation: This ensures that any party involved cannot refute the validity of a message exchange. Modern toolkits and technologies such as digital certifications satisfy all of the above security principles. Found a nice article on MSDN describing the various types of services - a taxonomy for services. Jotting down the concepts explained in the article. Entity Services - Expose/Surface business entities in the system.e.g. employee, customer, sales order,etc. They contain CRUD operations and additional domain specific operations - e.g. FindOrderByPrice Entity Services abstract the underlying datasources and persistence mechanisms. Capability Services - Implement a specific business capability - for e.g. Pricing Service, Credit Card Processing Service, etc. They may use Entity Services for persistence. Thus Entity Services are "data-centric" and Capability Services are "action-centric". 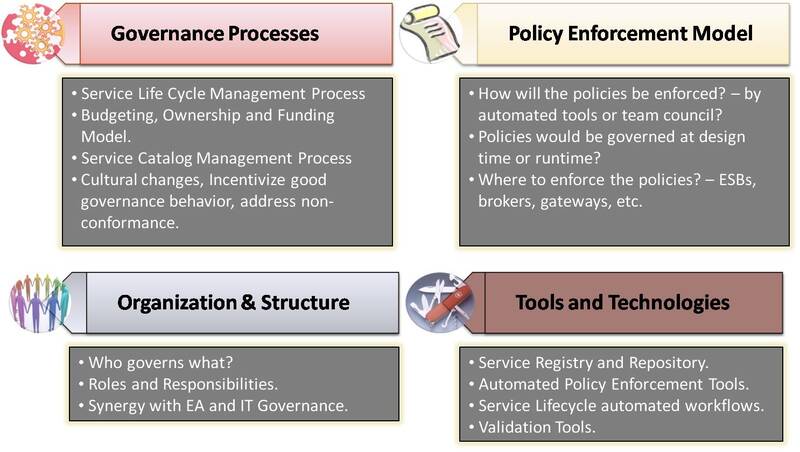 Process Services - Acts as a facade for a BPM process. Process services would maintain state due to the very nature of a workflow having to maintain state over a long running process. Process Services are typically implemented using BPM tools such as WWF, Biztalk, WPS, etc. Infrastructure Services (Utility Services) - Common cross cutting functions such as Logging, Auditing, Security, Authorization, etc.